Two protesters were killed and 13 others wounded in Togo today when security forces opened fire to break up demonstrations against the ruling Gnassingbe family dynasty. President Faure Gnassingbe has been in power in the West African country since the death in 2005 of his father, Gnassingbe Eyadema, who had been at the helm for 38 years. Wearing the red colors of the opposition PNP party, chanting and singing "50 years is too long! 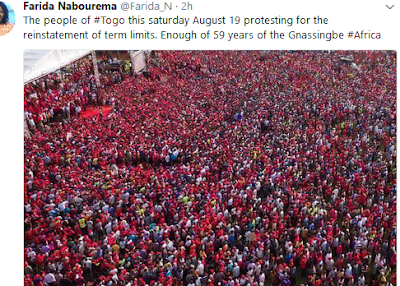 ", thousands of demonstrators in the capital Lome called for the reinstatement of the constitution limiting terms that Eyadema introduced in response to protests in 1992. Security forces fired tear gas to disperse them. But in a parallel protest in Sokode, clashes erupted and Togolese forces used live bullets. The security ministry said that apart from the casualties among protesters 12 gendarmes had also been wounded. "We do not understand our little Togo," said demonstrator Ali Boukari. "The father Eyadema was in power for 38 years, his son will soon have done 15 years. All we are demanding is a term limit and they shoot (tear gas) at us." The 1992 constitution brought in notional multi-party democracy after decades of dictatorship, and limited presidential terms to two, but ten years later lawmakers amended it to enable Eyadema to run for another term - a common pattern in Africa. Then, when he died, the military effectively tore up the constitution by installing his son as interim president, instead of the head of the national assembly, as was legally required.